The position of Google Hangouts has been put in a different situation following the release of Android 7.0 Nougat alongside the two mobile-centric communication apps – Google Allo and Duo. Rather than Android Nougat come with Google Hangouts as a preinstalled app, users will meet Google Duo. The Hangouts app, however, is still available, only that it has been deactivated by default and needs a manual activation via the Play Store in order to bring it back to life. With Google Duo offering video calling services only, the search engine giant also offers Google Allo, an app that focuses purely on messaging services. However, Allo gets the intelligent Google Assistant, which adds some “supernatural” abilities to the app. So, where does this leave the renowned Google Hangouts? As noted, the app must be enabled manually by users. This means that you will still be able to enjoy the continuity the app offers across multiple devices, be it a mobile phone, tablet or PC. In actual sense, this is where Hangouts beats both Allo and Duo – these two are only meant for the mobile world, but Hangouts allows users to transfer conversations from one device to another – in real time. One amazing feature that Google Hangouts supports is the company’s Project Fi service. This is an attempt by Google to get into the telecommunication industry. Project Fi offers users of Google Nexus 6P, Nexus 5X, Nexus 6 and the recent Google Pixel phones a platform where they can use any of T-Mobile, Sprint, U.S. Cellular or Wi-Fi hotspot – depending on which network is the strongest at a given location – to communicate via calls, text or internet. The carrier is considered one of the cheapest thanks to charges of only $20 per month – giving you unlimited calls and texts. If you need data, it’s only $10 per GB. If you use less than this amount in a month, the balance will be credited to your account. If you use more, the extra data will be charged at the same rate. You can check out more about Google Project Fi on our 7 reasons to try (and not to try) the service. But for those who are already using the platform, here’s how you can make a call or text with your Google Project Fi number using Google Hangouts, be it on a phone, a tablet or PC. It is possible to use Google Hangouts and send messages to friends via your Google Project Fi number. To do this, launch Hangouts on your phone and open the menu (top left corner). Proceed by tapping on Settings and select the Google account that is already linked to your Project Fi account. From there, you should see a “Project Fi calls and SMS” option – click the checkbox next to “Messages” and confirm the change. This way, you will be able to send messages that are delivered with your Project Fi number through Google Hangouts installed on all devices that use the Google account in question, including the Chrome extension. 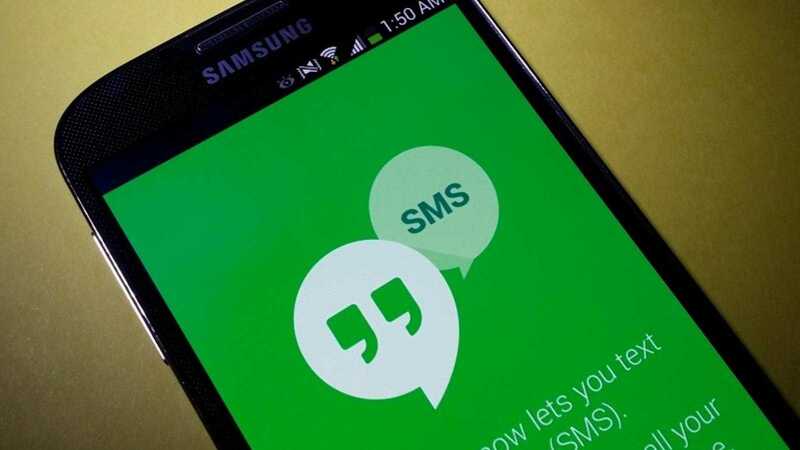 Like sending text messages, making calls also needs that the Google Hangouts app must be installed on the device you wish to use. However, keep in mind that both calling and messaging services will depend on your Project Fi data. There’s more to this Google Hangouts and Project Fi relationship on the official Google support page. Hangouts has a few seriously lacking features ie voice dialing does everything but dial the #. It’ll pull John Smith mobile up from contacts, but you have to look at the phone and press the phone icon to get it to dial. Potentially dangerous, and illegal while driving, really lame by design. Another major oversight is the lack of an audible alert when receiving a response while in a text exchange. Again you have to look at the phone to see if & when a response was received. Google ignores feedback on issues such these & offers zero reasoning or feedback. I stopped using hangouts BC of these reasons. The stock messaging app does all the above. I HATED HATED HATED the integration. My cell would NEVER ring, it only rings on the computer where one is unable to answer. I was missing SOOO many calls because my 5X just never rang. I just figured out how to disconnect hangouts from my 5X and now I am happy again. My experience is, unfortunately, not unique. There are lots of threads on the Fi Forums about this issue. Caveat Emptor!